Host Analytics introduces MyPlan, MyPlan Mobile to enable budget owners on the business side to collaborate on forecasts, plans, and agile course corrections. Already shaking up finance, blockchain could upend how manufacturing is run Syncron explains why blockchain could do everything from track E.coli to boost supply chains and customer loyalty. Budget owners on the business side don't want to use software designed for financial professionals any more than finance types want business people interacting with data or software features they shouldn't see or touch. These prevailing instincts are the reason Host Analytics (Host) recently added a business user-oriented MyPlan interface for its cloud-based enterprise performance management (EPM) system. At its May 21 to May 23 Host Perform user conference, the company followed up by announcing MyPlan Mobile, a device-native app (initially on iOS) designed to keep executives who are on the go connected to budgeting and planning processes. Held this year in Dallas and attended by some 700 customers, Host Perform also highlighted recent upgrades and coming attractions to the vendor's software-as-a-service-based EPM platform. But MyPlan and MyPlan Mobile were the clear centers of keynote and expo-floor attention. EPM vendors are all fond of saying that budgeting and planning should be a team sport. And in a perfect world, finance wouldn't rely on emailed spreadsheets and other disconnected, manual methods to gather data and collaborate with budget owners around forecasts and plans. EPM systems give finance a centralized, collaborative platform for budgeting and planning, but these systems have not typically seen broad adoption outside of finance. In Host's assessment that's because EMP systems are designed, first and foremost, for finance professionals and are not familiar or intuitive for business users. Rather than dumbing down its usual interface, Host developed MyPlan through clean-sheet design sessions with budget-owning business users. What these users want, Host discovered, is a simpler interface in which they can see where they stand (meaning actual performance to date), see where they'll land (meaning at the end of current budget period), and see what they can plan (meaning how they can adjust their spending and allocations to meet budget expectations). The result was the MyPlan interface (shown below), which was made generally available in March. The interface gives the budget owner -- in this case, a marketing executive -- a clear sense of where they stand in terms of people, equipment, travel, and program expenses. Green and red colors highlight where forecasts and budget figures are on track and where there's variance. Host's MyPlan and MyPlan Mobile interfaces are designed to show business users where they stand on actual performance and where they're forecasted to land by the end of the current financial period. By selecting a wrench icon, users can test changes, reforecast, and then update their plans in order to meet budget expectations. 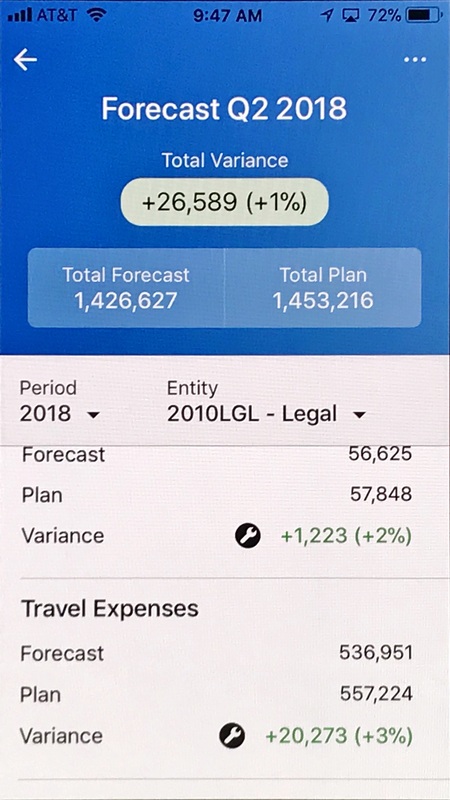 The MyPlan Mobile app, which will be released in the second half of 2018, will enable employees who are on the go to see the latest results and then respond, by adding or deleting a planned employee, adding or deleting an asset, or approving or rejecting an expenditure and submitting the update to finance. In a role-playing scenario during the opening keynote at Host Perform, a corporate lawyer used MyPlan Mobile to reviewed the latest expenditures for the Legal department, make changes to his plan, reforecast and then submit updates to his budget. Like other EPM vendor, Host offers integrations to Microsoft Excel, but the company says the business users it talked to when designing MyPlan pointedly did not want a spreadsheet-like grid for collaborative budgeting and forecasting. As I see it, it's a clean design that keeps things simple, but the strength of the MyPlan interface is that it's a connected and collaborative view of each stakeholder's budget and plan. Users can click on the wrench symbol to reallocate resources, optimize, and otherwise update their plans in order to meet budget expectations. I particularly like the fact that MyPlan eliminates toggling between applications by exposing everything the user needs within a single interface. Pricing details were not disclosed by Host, but customers will pay for a contributor subscription plus an upcharge for the MyPlan interface that will also include the coming MyPlan Mobile app. Dashboard upgrades added with Host's May 25 Spring release introduced server-side custom calculations that can be reused across dashboards, speeding development, and ensuring consistency. Drill-through capabilities expected this summer will enable users to see more details behind the numbers, whether they're about assets, employees, transactions. One-click rolling forecasts now on the roadmap will make it easier to do quarterly and monthly forecasts. You'll be able to create copies of forecasts and try new scenarios around selected parameters with a single click. MyPlan V2 upgrades on the longer-term roadmap will introduce "smart" recommendations for first-pass budgeting and ongoing adjustments to spending based on patterns in historical data. This is just a sampling of the upgrades Host has in the works. The company also detailed long lists of planned upgrades to its planning, consolidation, modeling, and reporting capabilities. Taken together with the MyPlan initiative, there's clearly healthy investment in supporting both deeper functionality and broader deployments. If there's one criticism it's that the move into machine-learning-based predictive and prescriptive capabilities is just getting underway, but it's early days for these sort of capabilities across the EPM space. The big trend in EPM is that companies are going cloud and want to take the power of planning into many operational areas. Host was already seeing some of the largest cloud-based EPM deployments, but with MyPlan and MyPlan Mobile, the company is raising the bar. One big customer in the property management space that already had 6,000 Host subscribers added 500 MyPlan users soon after it was released. It's an early sign that Host is poised to win even bigger and broader deployments.